Safestore Self Storage in Ipswich is adjacent to Asda on White House Road off Bury Road (A1156). You can also take bus number 8 to White House Road which is near the store. Safestore Ipswich's storage rooms are clean, dry and secure with 24 hour CCTV and intruder alarms. As the only key holder, you have unlimited access to your room during opening hours. So if you're looking for safe personal or business storage in and around Suffolk, then look no further than Safestore Ipswich. 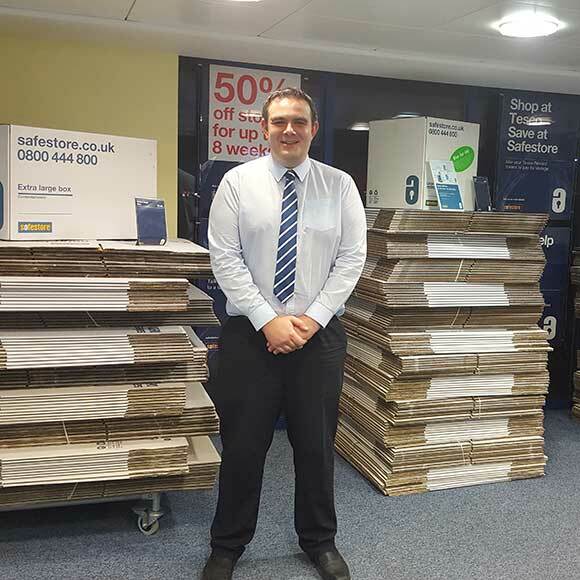 Our friendly in store team aim to make storage easy so give us a call today. We have a range of storage solutions at Ipswich Safestore, whether you are moving house or just need some space to store your things. Use our storage size tool to help you decide what you need. Get 50% off storage for up to 8 weeks at Safestore Ipswich with no minimum stay. Offer available at all UK Safestore centres. Get a storage quote at Safestore Ipswich today and reserve a unit for free. When you move in we won't need a security deposit either. Get 20% off at Safestore Ipswich if you agree a stay for longer than 12 months. Terms apply. Kevin joined Safestore as a Sales Assistant at the Ipswich store in 2009 and was promoted to Designate Assistant Manager for London and Essex stores in 2011. Later that year, his role changed to Assistant Manager of our New Southgate store and in 2012 he was promoted as a Store Manager for Stoke Newington. In 2015 he took the opportunity to move back to Suffolk as our Store Manager in Ipswich. Fantastic service - both online and in-store. Answered queries promptly, provided me with a great price. Very smooth and easy process. Very proffesional and helpfully new what they were doing and would highly recommend them to anybody that wants long or short term storage. Large or small they have everything a one stop shop for all storage needs . Friendly service and catered for our needs efficiently, professional and with no fuss. Dealing with the staff at safestore in Ipswich was great. They knew what I needed and answered my queries with knowledge and insight. However speaking online to the call centre was not always as good. They booked me a 125 Sq. Ft. Room when you didn't have one so ended up in a 150 Sq. Ft. Also they asked me to go round to sign and at the time I lived a four hour drive away which I did explain previously. Sometimes I think they don't listen and if they do didn't make a note on the file what I'd said. I have already filled in a review, but I'll say it again - Amanda and Tudor, the people on the desk, phone and computer, were excellent. Great and quick service. Extremely reasonable prices for the service provided. I feel great knowing all my valuables are kept with Safestore. Definately recommend Safestore. Really friendly staff and reasonable prices. Helpful and friendly staff made it very easy to choose a unit. Hi thank you for your recent feedback onÂ Safestore. I am pleased to hear you are happy with the service you have received so far, I do hope this continues. Please do not hesitate to contact a member of our friendly team in the store if there is anything they can help with. Kind Regards Sean Safestore Ilford Support Team. Thank you for your feedback. We are delighted to hear you received very good customer service. We look forward to seeing you again soon. Thank you for your feedback. We are pleased to hear that you found the storage hassle free and easy to use. Man and van removals service - from a single item to a full house! Call Yasin for a free quote - let the professionals handle your move.